How to download videos from Adobe TV to playback offline? Download and transfer Adobe TV videos to playback on Mac, Windows, portable devices, like iPad, iPhone, Windows or Android smart phones, etc. Trying to find a program that helps to download Adobe TV videos? Want to watch Adobe TV tutorials uninterrupted? How to download Adobe TV videos to playback offline? Adobe Photoshop, Dreamweaver, InDesign are welcomed programs by web designers and plenty of video tutorials are uploaded to Adobe TV to let their customers gain knowledge and knacks. However, Adobe doesn't offer downloader to download Adobe TV tutorials. So, if you want to watch Adobe TV videos offline on computer or portable media devices, a video downloader program is needed. If you have tried some online video downloader websites, but most time only ad content from Adobe TV or a segment is downloaded. Is there a program that helps to download the entire Adobe TV video, not ad content? In this article, we will introduce an all-in-one Adobe TV Downloader - Bigasoft Video Downloader Pro which features a powerful Adobe TV video downloader and converter. Support download video/audio from YouTube(VEVO channel, 1080P HD and 4K video), Dailymotion, Vimeo, Goear music, Metacafe, Break, Adobe TV, etc. Support download multiple URLs in batch, download playlist. Easy to convert downloaded video to compatible formats for popular devices, including iPhone, iPad, AppleTV, Xbox, PSP, Samsung Galaxy, BlackBerry, HTC and Windows phones. Download and merge F4F files into one video. Auto-detect best quality to download, 4K, 1080P, 720P supported. Firstly, download and install the ideal Adobe TV Downloader. Bigasoft Video Downloader Pro for Mac is compatible with Mac 10.6 or later, including Mac OS X 10.10 Yosemite, while Video Downloader Pro Windows version is compatible with Windows 10/8/7/Vista/XP. Go to Adobe TV and copy the URL of the video which you want to download and then paste it to the URL box on the Download panel. As soon as you have copied the URL of the Adobe TV video and mouse over the Past URL box, the URL will be pasted automatically. PS: Click "For Multiple URLs" and you will be able to enter multiple URLs. Click "Save Folder" button to choose the destination folder for the downloaded Adobe TV videos. If you prefer to convert the Adobe TV videos to other formats for your media device, be sure that the "Automatically Convert to" option is checked, and then click the drop-down button on the right side of the "Automatically Convert to" to select preferred format. Hit "Download" button, it starts to download video from Adobe TV. After it is completed, click the "Save to:" destination folder link to open the "Convert" folder to find the downloaded/ converted tutorial videos. 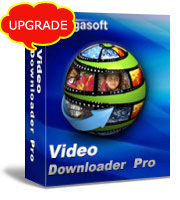 Want to know more about Bigasoft Video Downloader Pro? Just download the free version to have a try.